It has certainly happened to me many times, and it happened again recently with icons. After a long period where icon fonts seemed to be the natural, best-practice solution, SVG has introduced some useful innovations that may have changed the rules of the game. Accessibility: are there some issues with text-only browsers or screen readers? Semantic meaning: an icon is a glyph used to represent something else (this the simplest definition of this concept I've found; it comes from the Semantic-UI framework docs), so, are we creating a useful relationship between signs and the things to which they refer? Browser compatibility: do we need to ensure a large browser compatibility? HTTP issues: does our icon system unnecessarily tax our server (HTTP requests) and contribute to longer page load times? Can icon files be cached? CSS styling & animation: can we arrange and animate our icons using CSS? So, what is the best choice now? 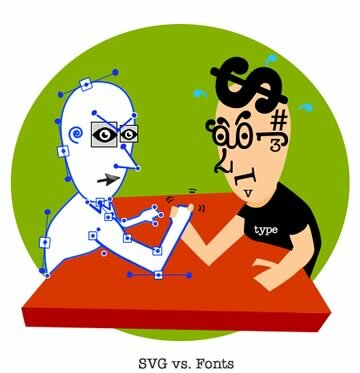 Can we still get by with icon fonts – or it is time to turn to SVG? I realized that when we talk about icons, it's easy to take for granted some topics which we have been dealing with in the past. They can help us to better frame the debate, but not everyone knows them. So, I've put together a very brief 'history of icons techniques in web authoring' to help clarify the debate. (If you feel you're ok with the history part, jump ahead). Back in the mid-90's – a time when browsers had little to no CSS support – icons were managed with the classic <img> tag. This technique brought with it a lot of accessibility and semantic issues. Furthermore, pages that used lots of icons had to fire off a barrage of performance-crushing HTTP requests: one for each icon in the page. Only one image file is required, regardless of how many icons you have (including :hover effects), so HTTP requests can be significantly reduced. Many accessibility (and semantic) issues are resolved, since background images and CSS pseudo elements are invisible to text browser or screen reader (while images are content). 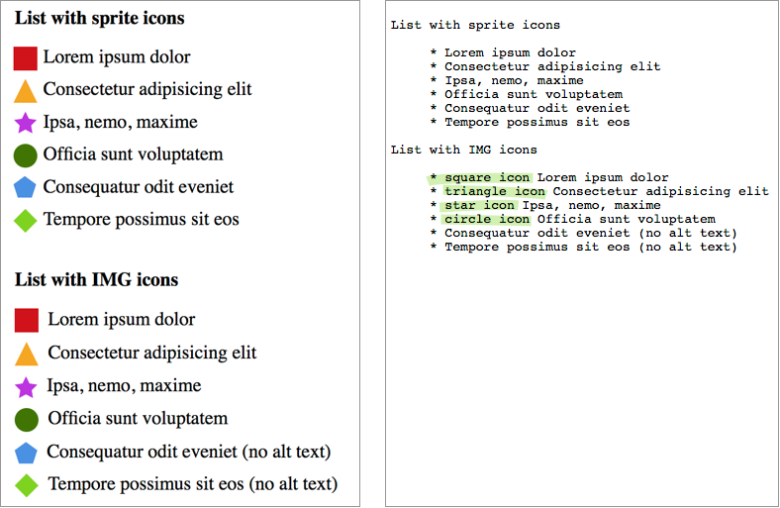 I've prepared a little test that creates two lists: one with sprite icons and one using <img> tags. On the left side of the image below, you can see how the two lists are close to identical (except that the second one required much more code). The right side is a screenshot of the same lists rendered with Lynx viewer (a web emulator of the text-only web browser Lynx) and it can give you some idea of how your web page may appear using assistive technologies (though A.T. output can vary widely). You can see that the second list containing the images alt texts (green highlighted), which in this case are perfectly useless, since they confuse the content rather than adding meaning to it. True, we can avoid this by using empty alt attributes (as in the last two items), but we still have content elements (the images) being used as presentational attributes. Of course, there are many cases which require meaningful icons, and the above CSS sprites example doesn't represent the best solution. We'll come back to this topic later. Although they represented a big step forward, CSS sprites are still bitmap images. As such, if you need to represent the same glyph in different colors or resolutions, you need a different images for each version. This problem was resolved by font icons: since fonts are vectors, they are resolution independent and can be easily colored through CSS. The most common way to apply icon fonts to a page is through a pseudo element – just like we did with CSS sprites. Unfortunately this doesn't resolve the issue of meaningful icons, since this technique still leaves them invisible to screen readers. The first part of the screenshot represents a common icon implementation (using a pseudo element). In this case the icon is part of the content and has a very specific meaning. Unfortunately Lynx can't see the icon, producing a nonsense sentence. You can see the result in the second part of the image. These topics are deeply addressed in some old articles on Filament Group blog, 24 Ways and CSS Tricks. Although accessibility issues regarding icons are not yet solved, you can do more using WAI-ARIA techniques, paying attention to font sizing, color contrast and so on (if you are interested in these arguments, take a look at the Web Content Accessibility Guidelines from W3C). But accessibility is not only an issue of screen readers. Even users of common browsers can be seriously impacted by our icon choices. Alex highlighted on SitePoint recently referencing a talk by Seren Davies. It demonstrates how icon fonts are not an evergreen solution, and that it may well be time to move on. Browsers have wonderful systems for receiving, scaling, rendering and manipulating text. Ultimately co-opting that system to manage and render imagery can only undermine that powerful text function. Finally, we come to SVG. both of them can be arranged and styled through CSS, but inline SVG allows you to control individual part of a single icon, giving you the option of multicolor icons (there are some multicolor solutions for icon fonts too, like Forecast Font or the one described in this Pixel Ambacht article. Nevertheless all them are much more complicated compared to SVG). Furthermore, with SVG you have access to glyphs strokes. the workarounds we need to improve icon font accessibility are not necessary with SVG files, since they have built-in semantically-sensible elements (i.e. <title> and <desc>), not unlike the HTML page itself. Inline SVG can't be cached and reused like icon font, but you can cache external SVG files, as you can with any image file. Icon fonts browser support is complicated but very comprehensive (including IE6+), while SVG requires at least IE9+. Explorer doesn't support external SVG files, but there is a polyfill for this. SVG symbols give you the best control on your icons as you can easily change their color and, by using relative units, you can resize them according to the related text. In the same way, text and screen reader support can't be always granted (for example, the previous pen is not correctly rendered with Lynx Viewer). If you want to see more example, take a look at my other pens about SVG, and if you want to go deeper with SVG and accessibility read Léonie Watson’s very interesting Tips for Creating Accessible SVG or Dudley Storey’s Making SVG Accessible article. Let's go back to the question we have started from: what is the best choice now between icon fonts and SVG? As usual, the answer is: it depends. You must consider all the element of your project evaluating compatibility, accessibility, user experience etc. Personally, I'm increasing the use of SVG symbols in my projects, and avoiding icon fonts when it's possible.